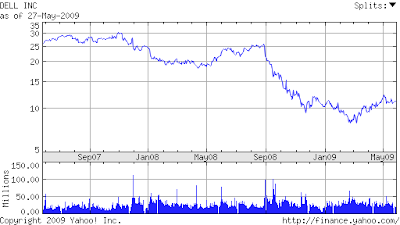 AlphaNinja - Dell (DELL) beat by a penny on light revenue this afternoon, and the street wasn't expecting much out of this quarter. -Unit sales down 17% and total sales down 23% year over year. -Dell sees the potential for a powerful upgrade cycle, as many companies have completely skipped the Vista platform, and the installed base is getting very old. 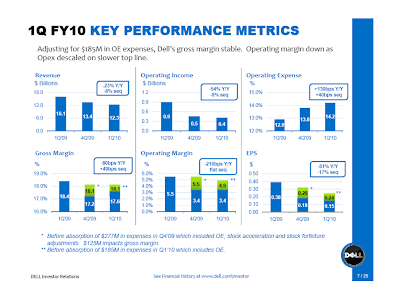 Dell has over $10billion in cash and ST securities - 2010 (ending Jan2011)FreeCashFlow could equal 17% or higher of the company's "net of cash" purchase price. The stock is a big-time BUY, and could be a double within the next year.